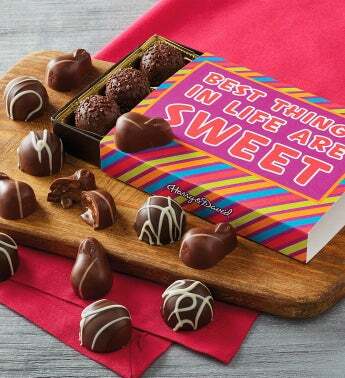 Celebrate sweet moments by sharing a delightful gift of gourmet chocolates. Made in small batches in our Southern Oregon candy kitchen, each truffle starts with our signature chocolate blend. This assortment features four delectable flavors including dark chocolate raspberry and milk chocolate filled with dulce de leche and is sure to brighten anyone's day.